Platycodon root (Jiegeng)-Platycodon grandiflorum-Radix Platycodi-Balloon flower root. Platycodon grandiflorum (Jacq.) A. DC. (Fam. Campanulaceae). Botanical Name: Platycodon grandiflorum (Jacq.) A. DC. (Fam. Campanulaceae). Common Name: Platycodon root, Balloon flower root. Part Used & Method for Pharmaceutical Preparations: The Platycodon roots are dug in either spring or autumn, but the autumn roots are better quality. After the root bark has been removed, the roots are dried in the sun and cut into slices. Functions: 1. To promote the dispersing function of the lungs; 2. To resolve phlegm; 3. To expel pus. 1. Failure of lung qi to disperse due to invasion of exogenous pathogenic factors manifested as cough with profuse sputum or sputum that is difficult to expectorate, fullness and distension in the chest and hypochondriac region, sore throat and hoarse voice. Platycodon root (Jiegeng) is used with Apricot seed (Xingren), Perilla leaf (Zisuye) and Tangerine peel (Chenpi) for wind-cold cough. Platycodon root (Jiegeng) is used with Apricot seed (Xingren), Mulberry leaf (Sangye), and Trichosanthes fruit (Gualou) for wind-heat cough. 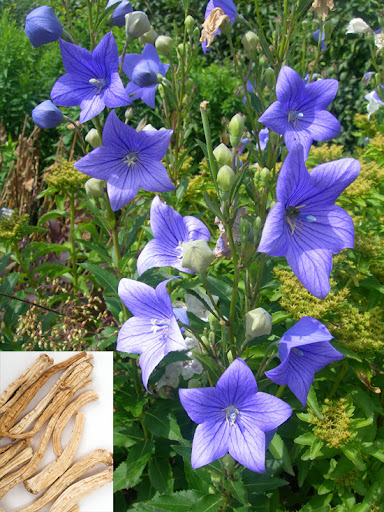 Platycodon root (Jiegeng) is used with Scrophularia (Xuanshen), Licorice root (Gancao) and Arctium fruit (Niubangzi) for sore throat and hoarse voice. 2. Toxic heat accumulated in the lungs (lung abscess) manifested as cough with blood or pus, yellow and offensive smelling sputum and chest pain. Platycodon root (Jiegeng) is used with Houttuynia (Yuxingcao), Benincasa seed (Dongguaren) and Trichosanthes fruit (Gualou). Dosage: 3-10 g decocted in water for an oral dose.